Ok, sportsmen, it's time to get serious. You've got your firearm. Or, more than likely, you have a few. You have your holsters, your lights, your cleaning items and other various other accessories which make your guns yours. So what's left? What's left is for you to decide whether you recognize that your firearm is an investment. And an investment requires your time, dedication, and cultivation if it's going to reach its full potential. And all of that is our way of asking, "What are you going to do when your weapon isn't working to its full capacity? Or maybe you're fortunate and your firearm isn't having any issues. What are you going to do to keep it that way? The answer is simple: just scroll down. What you'll see is a huge selection of tools to keep your gun - to keep your investment - working its best. Start with our choices of sight tools. What if you need to adjust your sights? What happens if, for example, your weapon requires you to remove your sights to get to the firing pin? Are you going to go to an armorer? Why trust someone else with your baby? With your investment? The answer is that you shouldn't, and with grabagun.com, you don't have to. We have a tool to fit every gun, and for every problem those guns might have. In addition to sight tools, we have gun vises to keep your weapon solidly in place when you need it to be. You'll also see that we have a wrench for every purpose. 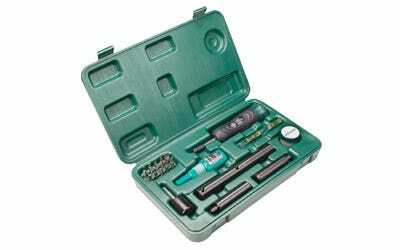 We have armorer's tools, crosshair tools, and generalized tool kits to fit every need. Look to grabagun.com to help you ensure that your investment continues to pay out dividends for years to come.